Rheumatoid arthritis, commonly abbreviated RA, is an autoimmune disorder. Case report rare manifestation of rheumatoid arthritis. Neutrophils - perivascular (without vessel wall injury). AKA joint with rheumatic disease. 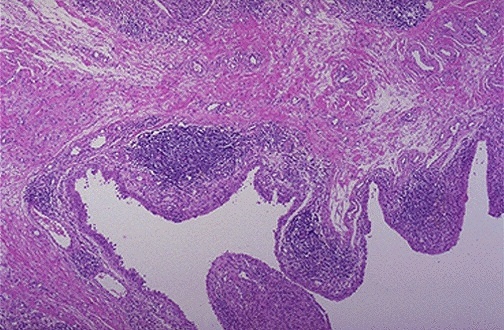 Pannus - fibrovascular tissue or granulation tissue. Irregular surface - synovial hyperplasia. Subchondral cysts - involve the entire femoral head (late stage of disease). Osteoarthritis subchondral cysts are associated with cartilage loss. Gross image of RA (medpath.info). Synovial hyperplasia - with papillary or polypoid architecture. Synoviocytes may show binucleation and mild atypia. Changes are non-specific - DDx includes other rheumatic diseases (systemic lupus erythematosus, psoriatic arthritis). - CHRONIC SYNOVITIS WITH SYNOVIAL HYPERPLASIA AND LOSS OF CARTILAGE. - BONE WITHOUT APPARENT PATHOLOGY. The findings are compatible with rheumatoid arthritis. - CHRONIC AND FOCAL ACUTE SYNOVITIS. - GRANULATION TISSUE AND HEMOSIDERIN-LADEN MACROPHAGES. - DEGENERATIVE JOINT DISEASE WITH CHRONIC SYNOVITIS AND SYNOVIAL HYPERPLASIA. RA may involve the lung. Amyloidosis may be due to RA. Felty syndrome is associated with large granular lymphocytic leukemia. ↑ 1.0 1.1 Mashek, HA. ; Pham, CT.; Helm, TN. ; Klaus, M. (Jun 1997). "Rheumatoid neutrophilic dermatitis.". Arch Dermatol 133 (6): 757-60. PMID 9197831. ↑ Lester, Susan Carole (2005). Manual of Surgical Pathology (2nd ed.). Saunders. pp. 223. ISBN 978-0443066450. ↑ 3.0 3.1 Resnick, D.; Niwayama, G.; Coutts, RD. (May 1977). "Subchondral cysts (geodes) in arthritic disorders: pathologic and radiographic appearance of the hip joint.". AJR Am J Roentgenol 128 (5): 799-806. PMID 404905. ↑ 4.0 4.1 4.2 URL: http://www.medpath.info/MainContent/Skeletal/Joint_02.html. Accessed on: 10 November 2012. ↑ Humphrey, Peter A; Dehner, Louis P; Pfeifer, John D (2008). The Washington Manual of Surgical Pathology (1st ed.). Lippincott Williams & Wilkins. pp. 660. ISBN 978-0781765275. ↑ 7.0 7.1 Mitchell, Richard; Kumar, Vinay; Fausto, Nelson; Abbas, Abul K.; Aster, Jon (2011). Pocket Companion to Robbins & Cotran Pathologic Basis of Disease (8th ed.). Elsevier Saunders. pp. 328. ISBN 978-1416054542. ↑ Liu, X.; Loughran, TP. (Jul 2011). "The spectrum of large granular lymphocyte leukemia and Felty's syndrome.". Curr Opin Hematol 18 (4): 254-9. doi:10.1097/MOH.0b013e32834760fb. PMID 21546829. This page was last modified on 8 November 2014, at 23:49.